The following article describes how to paint a Mandelbrot set with JavaFX. The Mandelbrot set will be painted into a javafx.scene.canvas.Canvas with the methods GraphicsContext.setFill() and GraphicsContext.fillRect(). To generate a graphical representation of the Mandelbrot set you calculate the speed of the convergence (convergenceValue) of every point in the set. The convergenceValue is mapped to a color. So every point in the set has a color and the result is a graphical representation of the Mandelbrot set. * Mandelbrot set with JavaFX. * determines the color of the point. 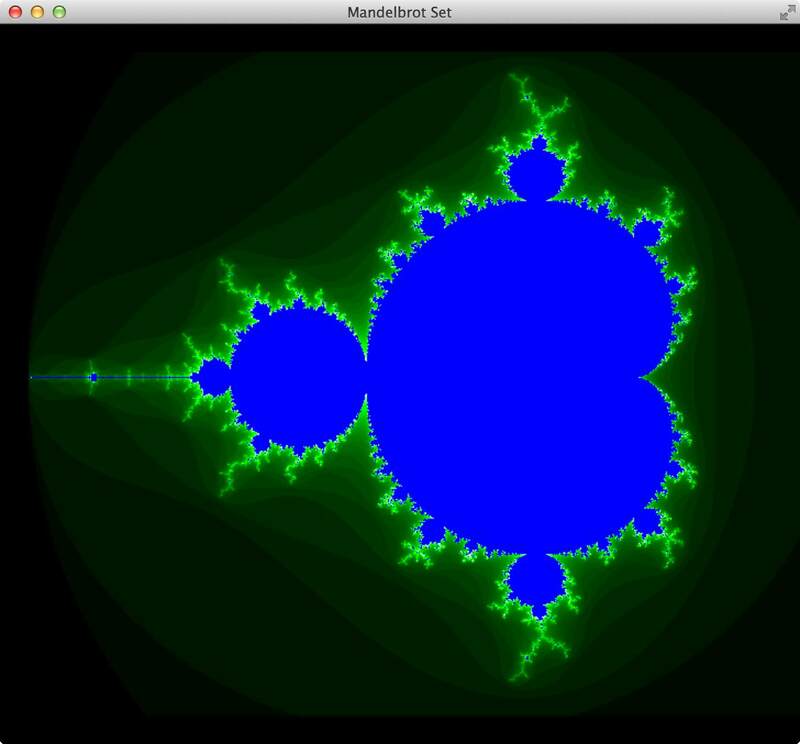 In the start method you create a Pane and add the Canvas for the Mandelbrot set. The Pane is part of the Scene. The variables X_OFFSET and Y_OFFSET are used to create space between the border and the canvas. The paintSet method is used to examine all points of the Mandelbrot set. For every point the convergence is checked with the method checkConvergence. The convergenceValue is used to create a Color which is used to fill a rectangle with the size 1. If a point is convergent a pre-defined color is used (Color.PURPLE). The interesting part of the application is the method checkConvergence. In this method the complex number c(n) = ci + c is analyzed. The lines 84 and 85 calculate (zi+z)^2 = (xi)^2 + 2(zi+z) + z^2. Please note i^2=-1. So you get 2*(z+zi) and z*z - zi*zi. In the lines 86 and 87 the real and imaginary part of number c is added to z. The if-statement is used to check if the number converged. The condition is a simplification of |x|>2. If z is greater that 2 the function diverges very fast so you can leave the method with return. The number of needed steps i are the convergenceValue. The variable convergenceSteps is needed to interrupt the loop for the divergent numbers. More informations about the Mandelbrot set can be found here. The article how to create such an application can be found here: JavaFX - Fractal: The Mandelbrot and the Julia Set.